These are from Sky’s David Blevins. And here is how Blevins sums it all up very crisply. While there has clearly been some commendable progress, we are very concerned over the Northern Ireland backstop proposal. This is a dreadful way of negotiating. Just weeks ago, the prime minister said ‘no UK prime minister could ever agree to this’. Once again we appear to have caved in. This is totally unnecessary and UK negotiators must insist that this is removed from the text. We also have serious concerns over the proposals for our fishing waters. Under the current plans, we will not be taking back control of our fisheries when we leave the EU – something which the government had previously promised. Mats Persson, who worked in Downing Street for David Cameron as a Europe adviser, says that, although a transition deal has been announced today, the fact that it is conditional on a final withdrawal agreement being reached in the autumn means businesses cannot be 100% sure it will happen. As a result, many will want to activate “no deal” contingency plans, he says. According to BrexitCentral’s David Scullion, the Scottish Conservative MP Ross Thomson has said the UK should set its own fishing policy during the transition. The government claims that the UK will not be part of the commons fisheries policy during the transition because it will not be in the EU. This is technically correct, although for all practical purposes the UK will remain in the CFP during that period. Steve Peers, a professor of EU law, has written a long Twitter thread on what’s new in the draft withdrawal treaty published today. It’s thorough and authoritative, and well worth reading if you take a close interest in Brexitology. This is from my colleague Dan Roberts. Open Britain, which is campaigning for a soft Brexit, says today’s transition deal contradicts seven promises made by Brexiters in government. There is a briefing here with the detail. And here is the start of a Twitter thread setting out the “broken promises”. This is what businesses have been calling for since last summer. It brings a welcome gift of time for firms on both sides. While some sectors may need more than 20 months to prepare for post-Brexit life, this is a victory for common sense that will help protect living standards, jobs and growth. It shows what can be achieved when people and prosperity are placed above politics and ideology. This is a milestone that many businesses across the UK have been waiting for. The agreement of a status quo transition period is great news for trading firms on both sides of the channel, as it means that they will face little or no change in day-to-day business in the short term. While some companies would have liked to see copper-bottomed legal guarantees around the transition, the political agreement reached in Brussels is sufficient for most businesses to plan ahead with a greater degree of confidence. Many companies will now have the clarity they require to proceed with investment and hiring strategies that would otherwise have remained in question. His reference to the absence of “legal guarantees” refers to the fact that the transition deal is conditional upon there being a withdrawal agreement. As David Davis, the Brexit secretary, admitted recently, there is a possibility that the withdrawal agreement talks could collapse without a deal at the last moment. In those circumstances, there would be no transition and the UK would leave the EU abruptly at the end of March next year. Finalising transition period terms will gift some certainty to the UK small business community and protect it from a damaging cliff-edge moment. Wherever possible, small firms want only one set of rule changes that take effect from the end of 2020. It’s good to see an agreement which will largely mean business owners can continue to operate broadly as they do now until 31 December 2020. Today’s announcement will make it that much easier for firms to plan, grow, trade, invest and hire. Scotland’s rural economy secretary, Fergus Ewing, has lambasted the Tories after the UK government agreed to keep the common fisheries policy in place for the full two year Brexit transition period. Ewing accused Ruth Davidson, the Scottish Tory leader, and Michael Gove, the UK environment secretary, of breaking promises that the UK would immediately pull out of the CFP on the day of Brexit. The Tories have sold out the Scottish fishing industry once again and Ruth Davidson should be shame-faced for her fastest broken Brexit promise yet. Just last week she said ‘Britain will leave the CFP as of March 2019’. Now we know not only will the UK have to abide by CFP rules during the transition period, it will lose the voting rights it has now. The Tories have delivered the worst possible outcome for Scotland’s fishing industry. 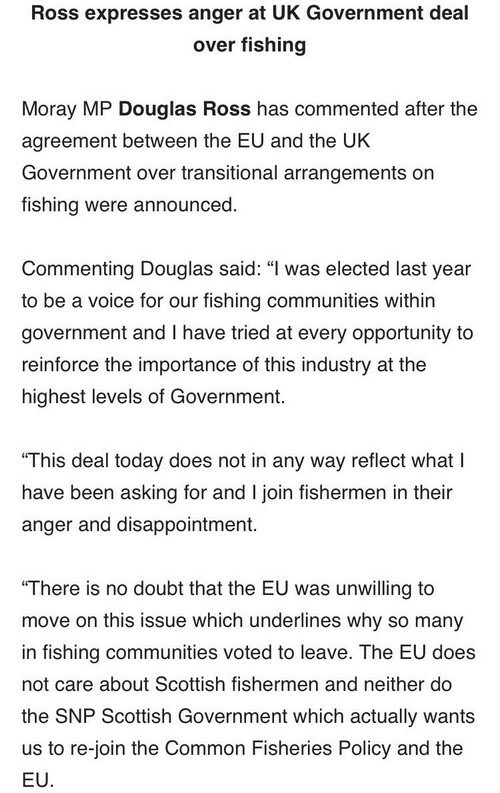 Having spoken to fishing leaders today, I know they are deeply frustrated with this outcome. I’ve made clear to them that I will continue to do everything in my power to ensure their interests are protected during the implementation period and beyond. The deal is uncomfortable puts both the Tories and the Scottish National party in difficult territory. The Tories won six prized SNP seats in north east Scotland, a stronghold for the British fishing industry, partly on promises of delivering Brexit. The SNP, however, still insists that an independent Scotland would rejoin the EU, and with it the CFP. Ewing’s stress on Davidson’s broken promises works only so far.